But, one of the things that made me pick my first real bike was it coming with toeclips. Somehow, they separated the thing I was about to drop the large part of my summer camp counselor’s salary on from the beast rusting in my parent’s garage. I wasn’t much of a mechanic at that point, and knew next to nothing about bikes, so it had never occurred to me to put clips on the old bike. The first time I got on the fancy mountain bike with toe clips, my heart was racing. Somehow, I test rode it without biffing, but sure enough, the first time I rode it after I bought it, I couldn’t get the second pedal to flip around right, and ended up riding the bike into a wall, getting my first scratch on the fork. Which, in hindsight, was all right – somehow, it took off the stigma and I was able to ride the heck out of the bike, which then got me interested in learning how to fix it, ’cause as an impoverished college student there was no way I could afford repair rates at a bike shop. These were on my first road bike, and are still one of my favorite pieces of bike kit. Not only functional, but lovely. I haven’t found a clipless pedal that looks as elegant hanging off the bike when leaned up against a rack. The pictures aren’t very good, but somehow I dig them. Even though they’re mid-range and Japanese, instead of high end and French or Italian. Once I’ve finished rebuilding that bike (it’s the one I painted in #25), I’m going to put these back on and use it to ride between the lab and the office. I have the low-end ones (the 105-level models), and they work great. The cleats are also quite walk-friendly, though they wear out more quickly due to this. All I can say is: look around and you’ll find killer deals on SPD-SL pedals. I’ve seen some for great prices on eBay and Craigslist. 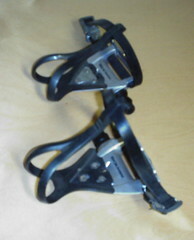 I also have SPD pedals on the mountain bike, and they are so, so nice. I had SPDs on the road bike at first, but had too many hotspots on my feet to really like ’em for long-haul rides. Toeclips might just be my next purchase. 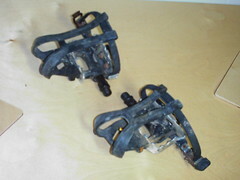 Unless I just bite the bullet and go for an all-new bike, better pedals seem like the best bang for my buck.